The below photos and part of the information about the history of Dagda, is from a report prepared for me in 1998 by the Latvian genealogist and historian Aleksandrs Feigmanis, who has given permission to publish it on this Dagda-ShtetLink site. 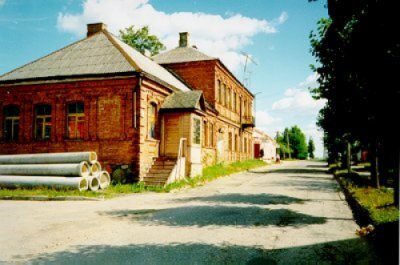 Dagda is a small town in the Daugavpils district, Latgale region of Latvia - (formerly Dvinsk district, Vitebsk gubernia). It is located on the shore of a great lake (480 ha) with many islands. There is a beautiful park in which is found the castle of Hilzens with a rich library and conservatory. The Latgale region (Latgola) is situated in the Latgale uplands and the lowlands of eastern Latvia, Velikaya and Polock. There are many forests and lakes in the Latgale region. It has a more continental climate than the rest of Latvia with colder winters with a lot of snow and warmer summers. Only few people lived in Latgale in the 17th Century. The vast unpopulated land attracted many Poles (landlords, officials, peasants and "Old Believers", who were persecuted in Russia). Then, when annexed by Russia, Russian officials, merchants and peasants moved to Latgale. Before World War II 58% of the inhabitants were Catholics, 16% Orthodox Christians, 14% Old Believers, 8% Protestants and 5% Jews. The many Catholics are due to the Polish influence during the 16th - 18th Centuries. The Dagda hamlet was founded ca. 1700 under Polish jurisdiction and in an area belonging to a Pole. During the years Dagda was burned many times - most severely in 1933, when the businesses and homes of Jews were burnt down, and many of the Jews were left impoverished. There is a catholic church which was built in 1742, an orthodox church, and before World War II there were three synagogues - one (in Skolas Street 6, Rigas Street 17 and Upes Street 3). There was a Jewish school in which at first the children were taught in Russian, later in Yiddish and finally in Hebrew. The Jewish community dates back to the beginning of the 19th Century. In 1847 there were 77 Jewish residents, in 1897 there were 1026 (70%), and in 1935 there were 1104 inhabitants of which 585 (53%) were Jewish. The part of Dagda, where the poor Jews lived, was called "Little America" - a name founded in the hopes and dreams of a better life. In the beginning of the 20th Century Jews began to emigrate from the Dagda - particularly to the USA and to South Africa. Many Jews emigrating or fleeing from Russia was helped by the Jewish community in Dagda, but some stayed on in Dagda. Most of the Jews made a living in commerce, as peddlers and tradesmen, and as craftsmen. But there were also pharmacists, doctors and dentists.